Is Yahoo! Mail worth the price you don't pay? Yahoo Mail integrates email, instant messaging, social networks, and SMS text messaging. Keyboard shortcuts, a desktop-like interface, and attention to detail make Yahoo Mail a joy to use. Yahoo Mail comes with 1 TB online storage. Yahoo Mail's spam filter could be more precise and its manual rules more flexible. You cannot label messages freely (and with multiple tags) or set up smart folders. Yahoo Mail does not offer IMAP access for desktop email programs. Yahoo! Mail is your ubiquitous email program on the web, Windows 10 and mobile devices with unlimited storage, SMS texting, social networking, and instant messaging to boot. Yahoo Mail offers free email accounts with 1 TB online storage at the yahoo.com, ymail.com and rocketmail.com domains. Access Yahoo Mail on the web, using POP and through IMAP (the latter using certain devices and email programs at least); you can also have mail at your Yahoo Mail account forwarded to another email address. Disposable email addresses let you create – and delete again – throwaway addresses that deliver to your Yahoo Mail account (only) as long as they are active. Up to 200 filters automatically file incoming mail. You can also block email addresses and instant messaging contacts. Two-step authentication and on-demand passwords (together with application passwords when needed) are available to secure your mail. YCollect mail from additional POP accounts, and you can send from these addresses using the web interface, too. Virus scanning and blocked-by-default remote images or other content in emails protects you from much online harm. Keyboard shortcuts, drag, and drop, tabs, address auto-completion and more lend Yahoo Mail desktop-like qualities. On mobile devices, Yahoo Mail offers slick web-based or powerful native applications (available for Android and iPhone). All connections to Yahoo Mail (through the web, through apps and through IMAP, POP, and SMTP) are use encryption by default for security. Paid Yahoo Mail services exclude advertisements. Space, with Yahoo! Mail, is practically no issue: you can accumulate as much 1 TB (1,000 GB) of email data. Yahoo! Mail offers folders to hold messages and decent search capability to find mail. 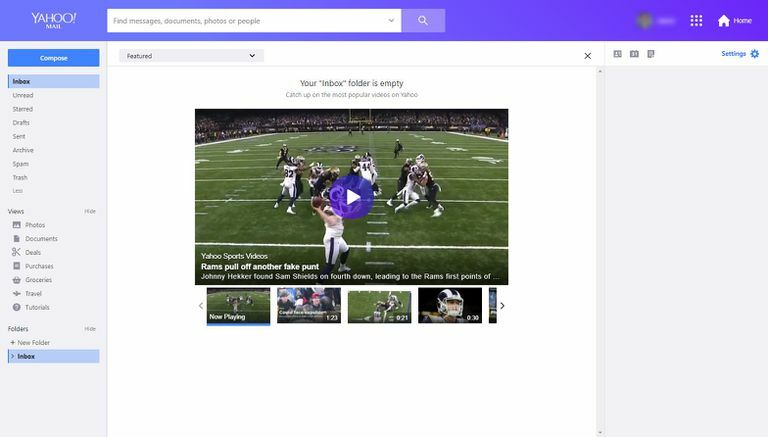 However, search categories cannot be saved as smart folders — Yahoo Mail does come with up to 200 filters that automatically file incoming mail, though, and you cannot freely apply multiple labels to messages. Speaking of filters and folders, Yahoo Mail comes with solid but, alas, not stellar spam control. It could do better in that area. Of course, Yahoo Mail scans for viruses and will protect you from web-bugs in unknown senders' messages. Yahoo Mail includes IMAP as well as POP access and can forward messages automatically. All connections between your device and Yahoo are secured with encryption by default. On mobile devices, Yahoo Mail offers a rich web-based application that allows for a full archive and some offline search, for example. iPhone and Android devices get native applications with these features, contact integration, support for attachments, and more.